On Monday, September 11, four hundred men and women, including several wives of prominent Helper citizens, arrived at the entrance to Price in cars and trucks. 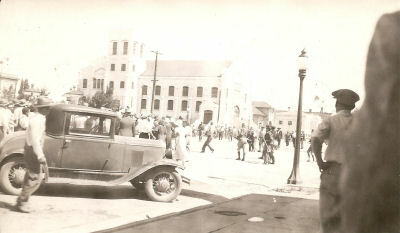 Led by Lawrence Mower of Helper, chairman of the strike committee, and Ephraim Towne, NMU leader at National, they formed twelve and fifteen abreast and marched down the main street of the town toward the courthouse. 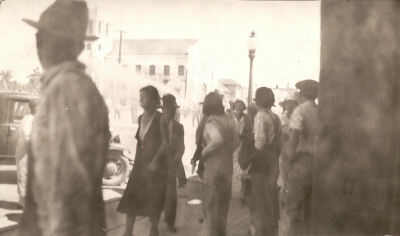 Although word had been sent out by deputies that citizens should stay away from Main Street, the streets were lined with people, almost all of them men. On-lookers crowded together at the windows of two-story buildings. At the First East intersection Sheriff Bliss stopped the marchers and told them to return to their cars. 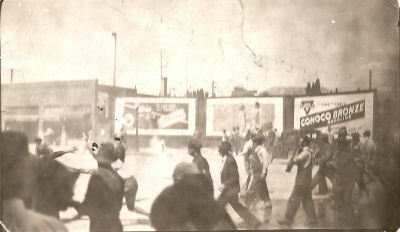 The National Guard Riot Squad with tear gas equipment and the Price City Fire Department with hose stood behind him. 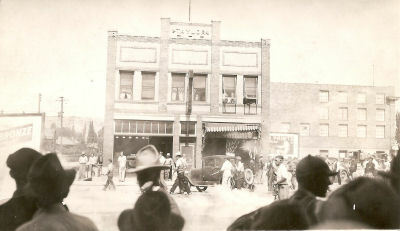 The Price police were stationed on the west side of the intersection, Mayor West and his deputies on the north side of Main Street, and Commissioner Reid and his men on the south sides of it. 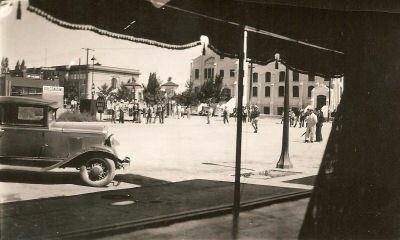 The state and local highway patrol kept traffic away from the street. Towne and Mower answered Bliss: "We're going through." National guardsmen then discharged tear gas toward the marchers. Struggling they stood their ground. Water shot out of the fire hose. A motion picture film of the confrontation taken by J. Bracken Lee - whose long political career includes two terms as governor of Utah and three as mayor of Salt Lake City - shows the force of water passing over the marchers, women in long cotton dresses and overalled men. They sway like wheat in the wind. ...Numerous hand to hand combats ensued, the officers being compelled to frequently use the butts of their rifles as clubs...some of the grenades . . [were] thrown back by the demonstrators." 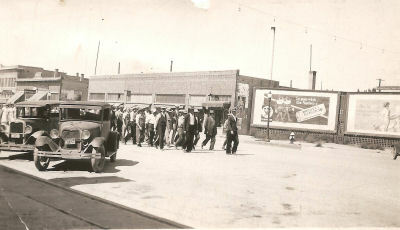 (Sun Advocate, September 14, 1933) In Lee's film rifle-carrying deputies smile as they follow the marchers up the railroad tracks west of Main Street to their cars. Young national guardsmen look as if they are enjoying an outing. 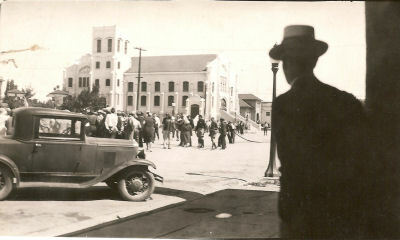 For the rest of the story visit the Utah Historical Society website to learn how to obtain a copy of the article. The photos are in the order that the photographer numbered them but the event could have happened in a different order. Special thanks to Louise Woodruff for donating these photos. During the years of 1925 to 1955 the Maple Creek Mine was in operation. The mine was located in Spring Canyon between the towns of Latuda and Standardville. Michael Francis, a descendant of the owners, has done extensive research about the mine and has shared his research for this webpage. Listed below is a timeline of his family in Carbon County and the business affairs of the coal mine. If you are interested in learning more about the Maple Creek Mine or the Francis family please contact him. 1/30/1920 US Census Frank Francis lives and works in Rains NOTE: The Francis name and it's Greek counterparts were misspelled more often than not. The correct Greek spelling is actually Frantzeskakis, but in most documents in Carbon County it was spelled Frageskakis.Eventually it became Francis because there was so much discrepancy. For this document, I've left the names as they are in the documents quoted. MF. 3/3/1924 Death Certificate Demitrios Frageskakis dies in Clear Creek. Cause of death is Veronal poisoning, a hallucinogenic sleep inducer. Listed as self induced, but could he have been poisoned? That is still unanswered. continuation of above Annual rental of land is in the amount of 25 CENTS per acre, for the first year, 50 Cents years 2 thru 5, and $1 per acre succeeding years. Also to pay a royalty of 10 cents on every 2,000 tons mined during first 20 years. Beginning in the 4th year, except when interrupted by strikes, the elements or casualties, the lessee shall mine and pay royalty on not less than 10,000 tons of coal per year. 6/8/1926 Articles of incorporation Maple Creek Coal Company, Inc. is incorporated in Salt Lake City. Officers are Emmanuel Frantzeskakis of Standardville, Director and President, Louis Callis of SLC, Director and Secretary and Treasure, Pantelis Marinakis of SLC, Director and VP, John Botonis of SLC and John Takis of SLC Directors. Amount of stock valued at $150,000 (300,000 at 50 cents each), purchased by Emmanuel Frageskakis 180,000 shares ($90,000), P. Marinakis 1,000 shares ($500), Louis Callis 500 shares ($250) John Botonis and John Takis 400 shares each ($200 each) with 117,000 shares ($58,850) held in treasury for purpose of developing the acquired property, or paying all operating or other expenses. The purpose of the corporation is to carry on a general coal and coke business, etc., and to raise money, either by issue of shares, or issue of bonds, mortgages, etc.. Remaining standard Articles of Incorporation. 11/11/1927 Minutes of Annual Meeting Board of Directors increased from 5 to 7 persons, to be presented to meeting of stockholders on 11/14/1927. Offices of Maple Creek Coal Company Corporation given as 802 Continental Bank Building, Salt Lake City. 1/14/1928 County Recorder Above lease of 1925 is recorded. 1/27/1928 Amendment to Articles of Incorporation Additional Board members listed as O.C. Childs VP, and S. Gianos, Director, T.C. Winn Director Peter Marthakis VP. 2/29/1928 News Advocate Mine is the newest in this region, with tipple completed last fall, and has since averaged 100 tons a day. Board of Directors plan to increase production. Superintendent voted authority to increase production from 100 to 500 tons a day. 5/16/1928 Recorded Mortgage New mortgage agreement, refinancing loan of 5/27/1927 for an additional year. 7/15/1928 Salt Lake Mining Review Same as above, but added the reason was so that "operations can be more extensively conducted by next year." 12/13/1928 Sun Production increased to 250 tons a day, according to E.C. Francis, according to the western Mineral Survey. This output was attained in less than one year, during which time the concerned opened up it's mine, installed modern electrically driven equipment, and built a camp and tramway. L.E. Callis is company Manager, J.E. McClusky, superintendent, and E.H. Burdick is the consulting engineer.Company installed a single drum electric hoist, modern coal cutters, a tramway to convey product to Standardville, and has contracted to ship 1,000,000 tons. Next year the company plans to erect a $75,000 steel and concrete tipple, to replace the old one. 450 acres in Spring Canyon, on a government lease, and has applied for 400 more. This is a continuation of the Liberty Mine Vein System. Our main slope has been driven 600 feet into the hillside below our 7 known veins, ranging from 7 to 12 feet thick. 16 feet above the main slope lies the liberty vein, a seam with an average of 8 feet of high grade coal. Sixty feet above is another seam 5 feet thick, 130 feet above this is the Castle Gate seam, 6.5 feet thick, and 50 feet above that is another 10 feet of coal. All the veins show clean coal at the outcrop. The ground is of such a nature that no timbering is necessary. They had no water, another favorable factor. 7/24/1929 Parawan Times and Kane County Standard Officials of Maple Creek announce they are ready to start grading their yards for a 3-track tipple. Completion expected for winter production. 11/30/1929 County Recorder Assignment of lease dated 8/26/1926 is recorded, after acknowledgement by Emmanuel Frageskakis that he executed same. 9/11/1930 News Advocate J.B. and Ida Lee sued Maple Creek Coal over insurance fees. 12/18/1930 News Advocate F. D. Bryner, trustee of Mutual Lumber filed suit against Maple Creek Coal, seeking judgment of $255.20 which he alleged is the balance of an account opened by the company. The total amount was $558.20, but $300 had been paid. 2/12/1931 News Advocate Sam A. King, Salt Lake attorney, and Frank Francis, representing Maple Creek Coal met with the Commission to purchase coal lands between the Standard Coal Company Property and the Maple Creek Property, which is known as the Pahvant Coal Company. This property had become the property of the county because of delinquent taxes. But it was decided to allow Pahvant to repurchase these lands. 4/30/1931 Sun Fire of unknown origin destroyed the wooden tipple at Maple Creek, at 3 a.m. Saturday, causing damage estimated at between $10,000 and $14,000. Discovered by workmen, it had gained a big start, and efforts to extinguish with dirt and what little water there was were useless.The tipple, dump, motor and scales used for weighing coal were all rendered useless. The shakers were the only part of the tipple saved. As a result, operations at the mine will be held up considerably. Fifty men were currently employed by Maple Creek. 1/21/1932 Vernal Express Maple Creek Coal Company started operations at it's #2 mine. 4/14/1932 News Advocate D.B. Warren, 25, was seriously injured when he was caught in a gasoline motor at Maple Creek mine. The accident happened when Warren attempted to put on the brakes, and the machine locked, and he jumped back in an effort to get out of the way, but not in time. He suffered a compound fracture of the right leg, and chest injuries and scalp lacerations. Taken to Helper Hospital. 6/23/1932 News Advocate Maple Creek Coal Filed suit against Royal Coal Company, asking that the defendants property in Spring Canyon be condemned for Public Use. According to the complaint, tracks from the branch line of the D&RGW railroad to the mine of Maple Creek crosses the land in question.The spur line has not damaged the holdings of the Royal Coal concern by virtue of the fact that it passes over the latter company's land, and the spur line is necessary to Maple Creek Coal, and the 1 1/2 acres of land is valueless for mining or building. They asked the court to determine the value. 3/8/1933 Mortgage Emmanuel Frageskakis borrows $5,000 from George Georgalakis against his property of SW1/4 of NW1/4 of Section 17, for 10% a year, due in 3/8/1934. 4/19/1935 Trust Deed For $10, Emmanuel Frageskakis grants to Pete Georgalakis of Standardville, representing George Georgalakis, SW1/4 of nw1/4 of Section 17, to be held in trust for the benefit of a corporation to be formed by Frageskakis to be known as Stain Coal Company Puts SW1/4 of NW1/4 of section 17 under the name of a new corporation. 9/14/1935 Release of Mortgage George Georgalakis, represented by Peter Georgalakis, his attorney in fact, releases the mortgage on the property mentioned above, with all debt fully paid. Continued from above Carbon County agrees to a settlement of taxes owed, with company to pay 1936 taxes in full, $250 down, and $50 a month till 9/1936, then $100 a month till 3/1937, until delinquent balance is paid. Maple Creek will also pay the District Mining Supervisor, USGS, $1,000 on royalties due, then $3,000 per year till paid off. Execution of judgment against James Kichas and Anna Mouskoundis for $5,000 to be released until US Government is paid off first. Maple Creek to put up a $5,000 bond for the US. Government for above release. The receiver is to be Sam Kounalis, with Class A stock to be issued to him for payment of $5,000. E.C. Francis is then to Deed to the Maple Creek Company the right of way obtained from Royal Coal. Signed by E.C. Francis and Karl V. King, for King and Brodie, his attorneys. 2/3/1936 Release of Trust Deed Pete Georgalakis of Standardville releases previously held trust deed, with all debt fully paid. 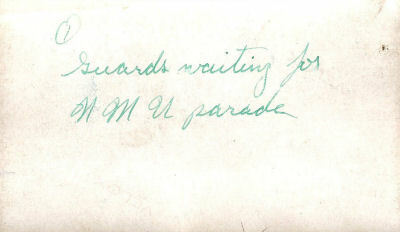 11/18/1938 Letter from P.C. Child He is informing the Utah Secretary of State that he has not had connections to Maple Creek Coal for 3-4 years, and is no longer an officer of the corporation. Late 1939-1940 Family History Kula Mavrakis Francis (Mrs. Frank J. Francis), works at SLC corporate offices of Maple Creek Coal for a year. 8/16/1941 Law Suit Maple Creek Coal sues Artemo Venturelli, Louis Seppi, Karl V. King and N.M. Miller for title to sw1/4 of nw1/4 of section 17, involving title and right to dispose of the tipple, slack bin, office building, motor house, tramway tracks and railroad tracks, claiming that title to said lands is already property of Maple Creek. 10/23/1941 Certificate of Tax Clearance State of Utah certifies that Maple Creek Coal has paid all delinquent taxes. 12/17/1941 Mortgage Maple Creek Coal borrows $5,000 from Jedd L and Willard Jensen of Salt Lake City. 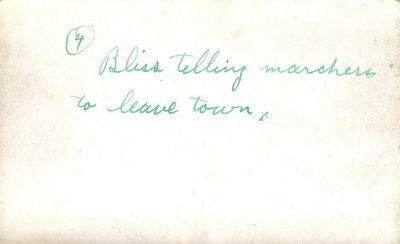 For NW1/4 of NW 1/4, NE1/4 of NW1/4 and SE1/4 of NW1/4 of section 17.Signed by E.C. Francis and James Kichas, Secretary of Maple Creek Company. 8/7/1942 Mortgage Mortgage between Maple Creek Coal and Continental Coal for $2,000, for wages due Willard Jensen for $600, to E.C Francis for $600, to Jedd Jensen $300, Grant MacFarland $400, etc. for property held by Maple Creek Coal described above. If Continental Coal fails to pay Royalties to U.S. Government, then Mortgage would be minated. Further provided that Continental Coal will not enforce payment of terminated this mortgage for 6 months after Continental Coal gives up it's lease, if Maple Creek Coal continues to make payments to U.S. Government. 8/7/1942 Mortgage Maple Creek Mortgages property to Jedd and Willard Jensen for $3,966.45 still owed, but with the stipulation that if Continental Coal Company fails to pay all current royalties to U.S. Government, and Unemployment Compensation Fund, then this mortgage shall be void.Maple Creek agrees to mine 50 tons of coal a day to pay off mortgage. 8/22/1942 Law Suit Maple Creek Coal sues Marl D. Gibson, asking for quiet title be granted for previously granted right of way to railroad tracks. 8/22/1942 Law Suit Maple Creek sues William Bailey for quiet title to NE1/4 of NW1/4 Section 17, and to tipple and other property upon said property. 9/14/1943 Lease Agreement Lease agreement between Maple Creek Coal Company and E.T. Liapis and E.C. Francis, trustees of Pacific Coal.Assigns lease previously held by Maple Creek Coal for lands described above. Maple Creek and Pacific Coal will petition Department of interior for a sub-lease of premises for a period of 10 years, with royalties to be to Maple Creek of 30 cents per ton, with 10 cents per ton of that being paid directly to Department of interior. 7/14/1947 Tax Clearance and Reinstatement State of Utah certifies that Maple Creek Coal has paid all delinquent taxes. 11/12/1948 Utah Fuels the West by Don Strack Maple Creek Mine is run by Pacific Coal Company. 3/1/1951 D & RGW:Traffic Circular 36-E In 1951 the Sweet Mine at Union was being operated by the Hudson Coal Company, the same company that operated the Maple Creek Mine in Spring Canyon. 5/23/1958 Tax Deed Carbon County conveys to Moroni and Delta Hurt of Price, Utah, property for a payment of $31.96 SW1/4 of MW1/4 of section 17. Fall 1973 Family History Frank J. Francis and brothers goto Carbon County to see about Maple Creek property, and find out that the lands had been claimed back by the U.S. Government due to non-payment of royalties and taxes. 11/9/1974 Certificate of Dissolution State of Utah issues a certificate of involuntary dissolution of Maple Creek Coal Company. On same date, similar certificates were filed for Pacific Coal and Beehive Coal. SCOFIELD -- On a hill overlooking this near-deserted mining town and a large reservoir sits one of Utah's most unusual cemeteries. Among the tombstones and headstones lie rows of weathered wooden grave markers, about four dozen total. Almost all have splintered into several pieces. Some have fallen to the ground. The names of the deceased are, for the most part, illegible. But the date they died is easy to read, and is common to each grave: May 1, 1900. That was the day the nearby Winter Quarters Mine blew up, killing at least 200 men. It was the worst single loss of life in Utah history and one of the five worst mining disasters in U.S. history. Although the 100th anniversary is nearly a year away, a small group of Scofield residents and state historians is working overtime to commemorate the event, put together a more accurate account of what occurred, and memorialize those who died. Their effort is called "A Day of Commemoration and Rededication," and it is being led by Woody and Ann Carter, who run a bed-and-breakfast in Scofield. The project just recently has begun to gain momentum, with the Utah Historical Society, the Carbon County Historical Society and the Helper Mining Museum, to name a few, pledging support. "There is a lot of interest in this. We felt it needed to be recognized," said Ann Carter, whose grandfather helped in the futile rescue effort. For the Carters, one of the first priorities is installing new wooden markers next to or in place of the old ones in Scofield Cemetery. "As you see these dilapidated wooden markers, you feel [the victims] deserve something better," said Woody Carter as he walked through the cemetery, which became the final resting place for about half of the mine-disaster victims. The Carters have persuaded the United Mine Workers of America union in Price to buy wood for new grave markers that will be proportionately similar to the original ones. 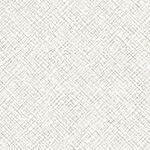 They cannot be precisely alike because wood widths are cut to different standards than wood 100 years ago. One of the biggest challenges to making the new markers, however, will be accurately recovering the names from the old wood. Looking closely from various angles, Woody Carter tried to decipher the name from one of the markers: Kangus? Or Kangas? "I can't be sure," he said. To be sure, the Carters will consult cemetery sexton records and other written accounts. They also have enlisted a Navy photographer in San Diego, who has agreed to use digital imagery to read names on old markers. "There may be a lot of names we just can't identify," Ann Carter said. In addition to installing new, legible markers, the Carters plan to organize various community groups to rehabilitate the cemetery, which needs new landscaping and masonry work on the entrance columns. "We've got our work cut out for us this summer," said Woody Carter. Craig Fuller, of the Utah State Historical Society, also has a tough job ahead. He must coordinate research into what really happened on that fateful May Day. Of particular concern is compiling a precise list of who died in the disaster. "There are still some discrepancies on the exact number of men who were lost," said Fuller, who is poring through journals, newspapers, genealogical records and any other record he can find about the disaster. Accounts of the number of victims have varied between 200 and 246, but some Finnish historians believe the number was as high as 350. The Finnish are particularly interested because about 60 Finns were among the dead. "It devastated the Finnish community in Utah," said Fuller, noting the entire Utah Finnish population at the time was only about 300 people. One Finnish family named Louma lost eight sons and grandsons. The parents and grandparents didn't speak English. "So what do you do? You are isolated, your breadwinners are all killed. It was a tremendous economic and social impact on them." Adding insult to the Finns' loss was an unsubstantiated rumor that it was a Finn who caused the explosion, Fuller said. May 1, 1900, was supposed to have been a happy event for the people of Pleasant Valley, a high-country valley in Carbon County that included the mining communities of Scofield, Clear Creek and Winter Quarters. 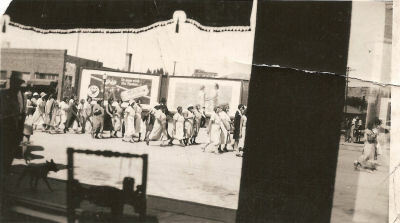 Valley residents were planning a big May Day celebration that night, with music, dancing and food from the many ethnic groups -- Greeks, Italian, Scandinavians and Welsh -- that worked the mines. But the holiday was no occasion for a day off work, and an estimated 300-plus men, ages 14 and older, headed for the mines at daybreak. About 10:15 a.m., an explosion reverberated through the valley. 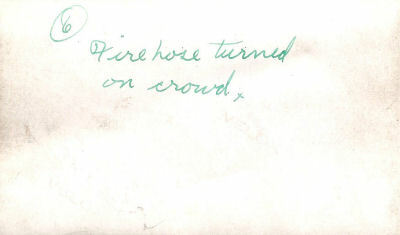 At first, most residents believed the noise to be cannon fire or fireworks, part of the the day's festivities. Within a few minutes, though, they saw billows of gray smoke and heard the frantic screams of victims and witnesses. It is believed that blasting powder used to loosen chunks of coal from the seams ignited coal dust in the No. 4 mine in Winter Quarters, sparking an explosion and inferno. Carbon County historian Irene O'Driscoll captured the drama in an account published in 1948. "The miners were confined with no chance of escape, caught like rats in a trap. No hope to recover anyone alive, no hope to ever look upon the living faces of those entombed," O'Driscoll wrote. The explosion threw one miner several hundred feet across a canyon. The miner was impaled on a tree and suffered a cracked skull, but survived. 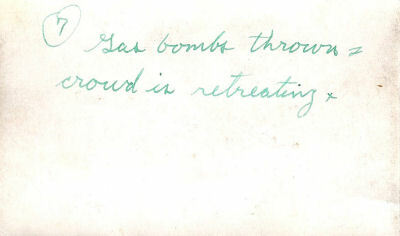 Poisonous gases from the blast spread quickly to the No. 1 mine, killing additional miners there. It took 20 minutes for the air to clear enough for rescuers to reach the nearest victims. "Hope had been entertained that some of the men, especially in No. 1, would be found alive, but the farther the rescuers went, the more apparent became the magnitude of the disaster. Men were piled in heaps, burned beyond recognition." Some men were found clutching their tools, indicating instant death. Others were found to have died while crawling to escape smoke and fire. For the next five days, Pleasant Valley was the antithesis of its name as rescuers pulled bodies from the mines, wrapped them in sheets and placed them into pine coffins, shipped by train from as far away as Denver. "My God, it is awful," wrote a Salt Lake City reporter covering the story. "Whole families are wiped out and the women do nothing but shriek and wring their hands day and night." Besides decimating a sizable portion of laborers, the Winter Quarters Mine Disaster created at least 107 widows and left some 270 children without fathers. Nearly every home in Pleasant Valley was affected. The last child of a Winter Quarters victim died earlier this decade. (update)The next closest living links to the disaster are grandchildren who never knew their grandfathers. One is Melba Erkkila. Her maternal grandfather, Edwin Street, was among the victims. Erkkila might have lost her paternal grandfather, too, had his wife not "had a premonition that morning and wouldn't let him go to work," she said. It is stories like Erkkila's that Fuller and the Carters are trying to preserve and share with a public largely unaware of the tragic story that is part of Scofield's mining heritage. This newspaper article was written by (Brent Israelsen/The Salt Lake Tribune. on Monday, May 31, 1999. After this article was written the following information was received by Gary Ungricht. 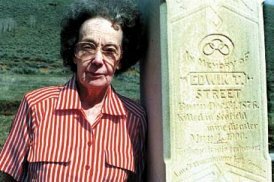 My paternal grandmother, Manilla Dewey Farish, is the last surviving child of one of the victims of the Scofield Mine Disaster. She is 101 years old! Her father, Robert Farish, died in the Scofield Mine Disaster, along with his older brother, Thomas Farish, and Thomas Farish Jr., who was one of the boys who died in the explosion. Manilla was born on July 9, 1898. Thus , she was nearly two years old when her father perished in the explosion. Her mother, Mary Evans Farish, was left a widow with six children to raise. Her father, Robert Farish, was originally born in Ohio, and her mother was born in Wales. The six children of Robert Farish and Mary Evans were: Robert, Fannie, Hazel, Margaret, Manilla and William. 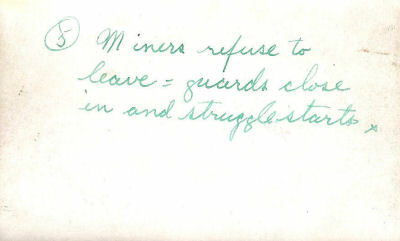 Manilla says that her father, Robert Farish, would have survived the explosion, if resuscitative measures would have been performed on him, because, she states that his heart was still beating when he was removed from the mine. He was overcome with the afterdamp gas and stopped breathing. Robert's older brother, Thomas, exited the mine after the explosion. When he realized that his son, Thomas Farish, Jr. , did not come out of the mine, he went back inside to rescue him. Tragically, the son was found on his father's back, as his father tried, in vain, to carry him out of the mine. Both were overcome by the afterdamp gas and perished. Thanks to Gary Ungricht for this update. The early morning stillness of Pleasant Valley was broken by the miners, especially those of Welsh descent, singing as they left for work on May 1, 1900. Spring had finally come to the valley and the harsh winter that had helped give Winter Quarters its name had all but disappeared. On the minds of many that morning was the evening's celebration to open the new Odd Fellows Hall. In addition it was Dewey Day in commemoration of Admiral Dewey's naval victory over the Spanish in the Manila Harbor. Instead of a celebration that evening, 200 miners would be dead, or near death's door, and the towns of Winter Quarters and Scofield would be in mourning. Riding with the men was William Parmley, mine foreman, whose brother was Bishop Thomas J. Parmley, mine superintendent. The men, who were paid by tonnage rates instead of hourly, and supplied their own tools and blasting powder, found their working areas. Some started work in No. 1 which had a portal almost level with the town of Winter Quarters while others reported to No. 4 located on an incline that opened out high above the ravine where the town was built. After a few hours work, Thomas Bell, who was working in No. 1. decided to go home. He was waiting for the next car to come along when his partner, Thomas Farrish remarked. "You might as well go on and walk out, that car isn't coming for half an hour." Bell did walk out and had gone half way down the hill when the explosion came. Less than two hours later, he was bringing out Farrish's body. The explosion occurred a half mile inside No. 4. The force was so powerful, it completely leveled a shack that stood outside and tore out the motors and drums for the mine cars. John Wilson, a driver who was at the mouth of the mine was knocked 820 feet down the ravine with a crushed skull and splinter impaled in his stomach. The party then charged up the hill while the towns people began to pour out in the streets. Smoke was coming out of the mouth of No. 4 and the opening was partially blocked by fallen timbers. It took the rescue crew 20 minutes of concentrated efforts to clear an opening into the mine. While the crew was clearing the entrance, other rescuers found Wilson on the hillside and the engineer, who would have been in the demolished shack at the time of the explosion if he hadn't been down the incline replacing a derailed car. The engineer suffered only minor injuries. Another man, who assisted in pushing the loaded trip over the knuckles, was found with his foot crushed, shoulder dislocated and other severe injuries. An assistant helper with a broken jaw and crushed head and a miner who had a broken arm and a leg and internal injuries were found near the mine mouth. The injured were taken to homes for care. Once the crew could enter the mine, canvas for battices to the portal (air corriders along the mine shaft) were brought. The first man found inside the mine was Harry Belterson, who was badly burned, he passed away that night. nearby was Willian Boweter, who was found alive. Belterson and Boweter were the only survivers found in No. 4. As the rescuers cleared out each section, the bodies were carried to the mouth of the mine and piled in heaps. There weren't enough men left in Winter Quarters to haul the dead down to the town. In Winter Quarters the company store employees brought out the store's supply of blankets and pillows for the wounded, not realizing there would be few survivors. Miners from nearby Clear Creek soon arrived to help bring the bodies down the steep hill from No. 4 to the barn across the ravine. 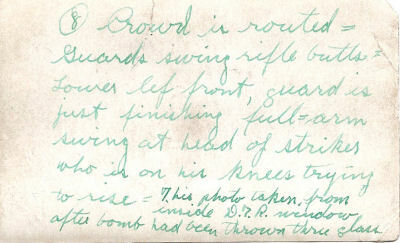 As each body was brought down, wives, children and relatives of the men rushed forward calling out names. Soon the air, which was once filled with singing, resounded with screams of women as they saw what was left of their husbands. The rescue party, now reinforced, passed from No. 4 to No. 1. The first victims they came upon were Thomas Livsey and his son, William, both badly burned. Here the crews piled the men upon the mine cars, sometimes 12 high. The dead from No. 1 was taken in the boarding house, where, at one time, 66 were laid out ready to be washed. As soon as the bodies were washed and identified, they were either carried to the school house or meeting house where undertakers arrived at that night and began embalming the bodies. In No. 1, the after-damp claimed many victims with most men dying of suffocation. Others were buried under tons of dirt and debris. Residents felt the men in No. 1 were taken by surprise and may have thought the explosion was set off to celebrate Dewey Day. Some of the bodies were found with their tools still clutched in their hands, and one man, who had sat down to fill his pipe, was found with the filled pipe still in his hand. Down in the town, Miss Daisey Harrom, a professional nurse from Salt Lake, was in Winter Quarters for a visit, ran an infirmary for the injured until a train load of doctors sent from Salt Lake by the company arrived. It was determined that two men escaped from No. 4 unassisted while 103 made their way out of No. 1. The bodies of the unlucky ones were brought out of the mine by rescue teams composed of men from Castle Gate, Clear Creek, Sunnyside and local miners. The bodies from No. 4 were washed on May 2 and taken down to lie with the men from No. 1 at the meeting house. That same day a special train left Winter Quarters taking A. Wilson, Harry Taylor, William Boweter and John Wilson to St. Mark's Hospital in Salt Lake for treatment. There John Wilson had a steel plate inserted into his head. Coffins also started to roll into the town. The entire supply of coffins in the Wasatch front was sent to Winter Quarters, and one shipment from Denver helped to supply the need. Thursday, two days after the disaster, a work force of 130 plus 75 volunteers from Provo started digging graves in a section of the Scofield cemetery. One hundred and fourteen were buried there Friday with Apostles George Teasdale, Heber J. Grant and Reed Smoot of the LDS Church performing the services. The graves were covered at 4 p.m. While funeral services were being prepared in Scofield, the regular train left Winter Quarters Thursday, carrying nine bodies including three bound for Helper. Shortly after the regular train left, engine No. 128 pulled out of Scofield with 51 coffins. Two were left at Thistle to be transferred to the Sanpete branch while 11, including Daniel and John Pittman, were left at Springville; six, at Provo; two, in American Fork; one, in Lehi; eight, in Salt Lake; ten, in Ogden; and 11 in Coalville. Each coffin was decorated with flowers sent to Winter Quarters in nine coaches by Salt Lake City resident. Apparently 114 were buried in Scofield, 69 buried in other parts of Utah, and 12 buried outside the state. The death total reached 200 in August when the 200th victim died and was buried. The company's manager, William G. Sharp, cancelled all the debts of the victims' families at the company store, a total of $8,000, and paid a $500 death benefit compensation to each family. it was estimated that 113 widows were left after the disaster with 306 children left fatherless. On May 5 Utah Governor Wells called for the people in the state to contribute to a relief fund and over $110,000 was collected, but the amount given to the families never reached that mark, and many widows left the area with the onset of winter still awaiting some allotment from the funds. On May 3, Carbon County Attorney L.O. Hoffman, traveled to Scofield to set up an inquest on the body of John Hunter, one of the mine victims. William Hirst, Jurstice of the Peace, acted as coroner. The state mine inspector, Gomer Thomas said the cause could have been a heavy shot of loose giant powder or loose powder exploding. "The giant powder went off, caught the dust, and exploded it, being in the end nothing but a dust explosion. I went to a place where it was claimed they had powder stowed away and the place showed that the explosion had started here and showed further by the action of the explosion and by the body that was found there, that it was burned more than the other bodies which we found." He also suggested the coal dust may have added to the explosion and suggested the company keep the dust watered down for safety purposes in the future. Today only one structure remains in Winter Quarters while the portal to No. 4 is caved in. There is no marker here of the disaster or in tribute to the men who died but a mile down the valley in the graveyard where 115 of the 200 who died May Day, 1900, are buried. Time is taking away their names from the wooden markers but the wood planks thrusting from the ground are still a reminder of one of this nation's greatest underground mining catastrophies. In weeks to come, the history of Winter Quarters and its short span of life will be presented along with the story of the Calico Railroad.